Grief is no respecter of ages; children and teens grieve the deaths of loved persons deeply. But because youngsters don't grieve exactly like adults, finding appropriate ways to support younger grievers is often difficult. In the words of child and family psychologist David A. Crenshaw, "Children can bear the truth, no matter how bad, better than they can bear being deceived." There is never a good reason to lie to children about the death of a loved one and the broken trust may never be completely repaired. While kids don't usually need (or benefit from) all the details that are known, their questions should be answered simply and honestly with explanations that are appropriate to their age. A 14-year old adolescent will likely experience the death of a grandparent very differently than his four-year old sister. One reason is the longevity of relationship; the four-year old might never have known the grandparent when healthy, for example. But a major difference is the way children at different developmental stages process thoughts and feelings. Fourteen year olds, for example, are generally capable of abstract concepts while a four-year old has difficulty imagining the things she hasn't seen and does not understand death as irreversible. How a person experiences grief is determined by many factors, but one of the most obvious is the relationship with the deceased. That is why a child's grief response at the death of the family dog can be significantly greater than the response the same child exhibits a few months later when a rarely-visited grandparent dies. Children do not need to be "shamed" into feeling sad. You may not see outward sadness, anger, or fear related to the death of a person with whom he or she felt no real relationship. Funerals and memorial gatherings are important times for family and community to acknowledge the death, celebrate the life that was lived and draw support from one another. 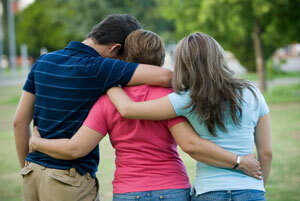 Children and teens share this need with adult mourners. When attending funeral ceremonies, young children are best served if they are accompanied by someone who can be especially attuned to their needs. This close adult friend, neighbor, or parent of a playmate can concentrate on the child's needs. Older children and teens can be included in the ceremony in ways that are appropriate to their age and relationship with the deceased. Your funeral director can make specific recommendations about how children can be involved in the funeral ceremonies. Youngsters often grieve in "spurts," so it might surprise family members and friends to see the kids out on the lawn playing football the afternoon of dad's funeral. Most adults could never bring themselves to such a place, but this is completely normal for children. Just as children are not helped by dishonest explanations, neither are they helped by explanations that attempt to create a spiritual or philosophical explanation for the death. "God needed another flower for His garden," and "Mommy just went to sleep" does not help a youngster grasp the fact of the death or the grief they experience. Instead, use factual, simple explanations with young children. For example, say "Something sad has happened. Grandpa has died. When a person dies, it means his body quits working. He doesn't eat or sleep or feel pain anymore. I am sad because I can't talk with Grandpa now." One challenge of grieving children and teens is that in many cases, the same loss that they are experiencing was also experienced by all or most of the people in their primary support system. The death of a parent is made more difficult for a child, for example, because the surviving parent, uncles and aunts, and grandparents are also deeply impacted by the loss. School counselors and teachers can be invaluable help, and should be informed about what is happening in the child's home. It can also be wise to seek the help of a support program designed especially for bereaved children and teens; programs can be found at the website of the National Alliance for Grieving Children. Teachers and school counselors will find additional help in our free brochure, Grief and the School Community. "We cannot say enough about how wonderful they were. We worked with Dave. He was truly understanding of our needs during out time of grief. He explained all of our options and didn't give us any pressure to make choices. He was patient and kind. It was as if he was a part of the family throughout the process. "